But there’s one girl, in an orange dress. Now, imagine a room full of Dutch sportsmen and women, clad in their orange kits. Would that same girl still stand out? Contrast attracts attention, creates interest, and adds drama. Without contrast, life would be pretty dull. Have you walked through a dark forest, and suddenly stepped into a brighter area… a field full of yellow buttercups drenched in sunlight? The contrast with the dark forest makes the ordinary flowers feel magical. Like a soprano in duet with a tenor. Or a cathedral towering high above town. Or a delicate butterfly fluttering in front of a rough brick wall. People are naturally drawn to contrast, because life is surrounded with it. Day and night. Male and female. Up and down. Good and evil. Love and hate. We can use this principle of contrast to draw attention to our words, to add drama, and make our writing sound so magical that people can’t stop reading … even if you write sales copy. How about a wickedly good trick? Contrasting combinations of an adverb and an adjective, like “crazy good” or “wickedly wonderful,” grab readers’ attention. Contrast transforms humdrum sentences into attention-grabbing headlines; and contrast can make your sales copy more enchanting, too. Contrast can make your product seem extra special; and it can even help overcome a hesitation to buy. Or perhaps you think the iPad Air 2 might lack power? So you can do more. While carrying less. The contrasting short sentences make Apple’s sales copy sound poetic. You’d almost forget they’re trying to sell you something. Cool breezes off Okawa River. Cherry blossoms glittering. Naoko and I practice hanami: picnicking under a sakura tree (ancient Japanese custom once reserved for Imperial Court). “Like this.” I gesture to her classic, fully buttoned collarless coat. She opens her soft wool coat to reveal a vibrant leopard print lining. The sales text above sketches an idyllic picture by appealing to the various senses: the glittering cherry blossoms in pink, the cool breeze, and Naoko murmuring. But the sense of calmness is almost rudely interrupted by the leopard print lining. This positions the coat as an expression of individuality and strong character. Are your customers angry, frustrated, down, or feeling overwhelmed? They don’t want to buy just a product, they want to turn their anger into calmness, their frustration into success, their sadness into happiness. And months pass…then years. How many of us know someone who’s been talking about starting something for 10 years? They’ll say, “I had that idea years ago!” And yet, they’re still dreaming. Imagine you use this program to identify a profitable idea. You know it works because you get your first enthusiastic, paying client who is delighted to pay for your services. You now have new money in the bank. Would you be more confident of your abilities? Would you be more motivated to earn more and use it to pay off debt, increase your savings, or take an extravagant vacation? Would you be able to take that first client and “tune” your work into higher-value work that you love…including charging more? Would you be able to focus on doing the things you love instead of making decisions based on money? People don’t buy a product or service; they want to buy a better life, a better version of themselves. To write persuasive copy, highlight this transformation—contrast where your readers are now with where they could be. Want to write content with oomph? Content that delights and persuades? Start with understanding your customer. Empathize with his pain points, no matter how big or how small. Then show him he doesn’t need to accept these pain points. A better way exists. Lastly, let him believe he can make his life better, with your help. Thats some amazing advice Henneke! I guess this technique hits two birds in one go. It both reminds the reader of the current pain while promising a better future. Another excellent article. I have been learning from you for a while now and thank you for your generosity and the amount of valuable information and advice you freely share. My current struggle is this. I sell seaweed skincare products which are helpful to problem skin conditions…for many people but not all. I have had psoriasis for 40 years and seaweed has helped me which is why I am bringing a range of products to the marketplace but I don’t want to make crazy wild promises of magical cures. I can’t seem to align my mission with obvious sales marketing. But, the products are selling even though I don’t know what I am doing and I would love to move to the next level as I am just scraping by at the moment and would love some financial security. I want to teach people about the potential benefits to them in using and consuming seaweed. My feeling would be to suggest that x may help. Hmmm…I can see by verbalising my quandary that I truly have no real idea what I am doing. Psoriasis needn’t be serious – seaweed skincare will help you manage and potentially eliminate the itch, the inflammation and the irritation. Speak to me …seriously. Thank you for help. Only after I read your comment did I see, and hear, “use x”, as you pointed out. I appreciate your take on this. I have been rather stuck. Henneke’s post, her response to my question and all the other comments sent my wee brain into overdrive and I’ve been sitting with a pencil and paper all day thrashing out the wording I want to use. You can say… Is your skin often itchy, red, irritated, and inflamed? Can you imagine looking in the mirror and seeing smooth, soft, glowing skin? I appreciate your suggestions. I like the idea of looking in the mirror. Hmmm. Some people see sales (and writing persuasive content) as selling to as many people as possible. These type of marketers tend to (a) make people feel insecure by making them feel even worse about their pain points and (b) overpromising how well their solution will work. I don’t like these techniques and don’t recommend them. For me, selling is about getting the right people to buy your product – the people you can really help. This doesn’t mean you sell fewer items; often this approach can be more persuasive for your target audience. I would always recommend honesty in your approach. Don’t promise magical solutions unless your solution does feel magical to your audience. If the product works better in some situations than in others, be upfront about it. It increases your credibility. The main reason your current text feels too sales-y is that it reads like a short tweet rather than persuasive text with substance. When you click through to the page of Ramit Sethi, note how he explains exactly what you get in the course (and how it’ll help you); and also how he uses testimonials throughout the page – both techniques are to increase credibility. So, think about – For whom does your product work best? And when does it work less well? Which active ingredients make it work? Do you have any test results to prove this? Which ingredients do other products have (and you don’t) that make itching worse? Which customer stories can you tell, providing specific details of why they decided to try your product, perhaps why they hesitated to buy, and how it’s not making their life better. Provide detailed, honest information to help people make the right purchasing decisions. I am truly grateful for your response to my question. As I said in an earlier comment to Peter, your original post and the comments here have led to me spending all day in my pyjamas drafting copy. I have written the questions you suggest I should ask on separate pieces of paper and answering them. It’s almost 600pm here in Irelan and I started early this morning. Isn’t it great to be fired up about your own business? As you will appreciate, the marketing language in this part of the world is far less direct than say the US. Now, I have had the lightbulb moment that I can adopt the language as required for the different marketplaces. Duh??? I’m so happy to read that you got unstuck and have been writing all day! It’s wonderful to feel inspired like that. And yes, use the language that speaks to your audience and that also feels good to you. No need to adopt a pushy marketing voice. 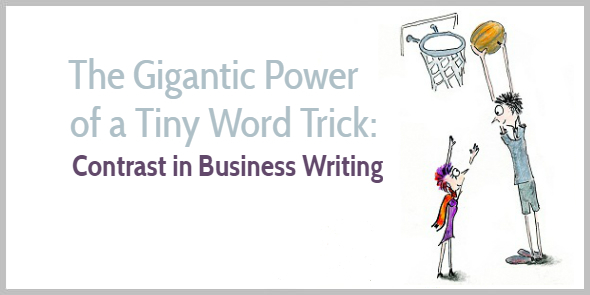 Try to write like you’d talk to a real customer. As always great advice, thank you for sharing. You have such a way with words and make it sound so easy. I know by keeping on reading and following your advice, I will get there too. Thank you for your kind words, Linda. Happy writing! Wish I had read this before doing my homework! 😉 I love how the difference in the images almost smack you upside the head and make you take notice. I literally almost felt a physical jolt coming out of the dream-like ‘scanning’ mode. Thanks for making it so clear and for all the great examples. However, one part of your post raises a question for me… you mention using a combination of adverb and adjective to create attention-grabbing contrast. I think I picked up from another post here on your blog that if you use adverbs it’s a sign that you’ve been ‘lazy’ in choosing the right tantalising verb. So in general, would you say avoid adverbs (in favour of using juicier verbs) unless specifically using this ‘contrast’ principle? That’s an excellent question; it’s exactly why writing is an art, not a science. You’re absolutely right. So, instead of using a adverb + verb, it’s usually better to use a stronger verb (instead of “speak softly” write “whisper”), and the same is true for adjective + noun (instead of “large house” write “mansion”), and the same is true for adverb + adjective (instead of “very big” write “immense”). That’s the general rule. However, if you want to attract attention (especially with a headline), you might occasionally want to break the rule and introduce contrast, but you definitely don’t want to do that all the time. While I never drink coffee (I don’t like the bitter taste), I do love the smell of fresh coffee. I love that metaphor…mmmm coffee! After just finishing my homework in the copywriting course, I enjoyed reading this excellent article as a reminder to use contrast when writing emails or blog posts. A frightful contrast, of a clean kitchen sink. Thank you for stopping by and for your kind words, Ray! Perfect timing, Henneke. I was feeling a bit blah about the title of the blog I’m currently working on. After reading your article I played with words to add contrast and it now has some zip and zaz. New title is: How to turn your failures into prize winning moments. Thanks as always for your super clear examples. I came in from Konrad Sanders’ tweet. I love the fine point break-down highlighting the contrast in each. The Peterman example was very subtle and artistic. The writer knows their target market well. I’ll bet that copy has sold quite a few of those coats! Thank you for stopping by, Robert! It seems that whenever my writing is feeling stale and lifeless your email appears, and like a soft summer rain on an upturned face it refreshes and enlivens, one sentence at a time. Thanks, Henneke, you are a joy to read. I’m short but have had dreams of easily dunking the basketball. Your opening image sure brought me into the article quite nicely! This is particularly relevant when explaining to family carers of people with severe disabilities, e.g dementia, that their caring role should not destroy their need to sustain their own well-being. Thank you again – from sunny Sydney! Yes, I can see that working particularly well for your niche. I assume some people are sort of giving up hope, and it’s important to acknowledge their struggle but make them believe they can make some changes to make their life a little better. Thank you for stopping by again, Paul. I appreciate it. That’s it in a nutshell Henneke – a carer can be overwhelmed as their family member loses the ability to live independently. However, a carer can do much to sustain their own well-being, as well as caring for their loved one’s quality of life. This is so true! Selling relief. Relief from long-standing problems. Blessed relief. It gives hope, inspires more energy, and can be addictive. ‘Empathize with his pain points, no matter how big or how small. The best point is about using the contrast is t use it while writing a blog post. The bloggers should convert a boring content into an interesting one by putting the contrast. The catchy headlines always work. People get attracted to visual content. Adding the contrast with the help of images and videos can enhance the engagement. Really great advice and tip on a persuasion strategy I never even thought of before. After seeing the examples you used here, I can see how it works and especially how effective it could be. I’m going to practice this technique so I can implement it effectively in future articles. Hi Henneke, I “lOVE ” your post. I am not sure just how I started receiving emails from you? As a person who is not real proficient in writing, but long to become proficient do you offer a beginners course? Some people are gifted in what they do. I feel that you are one of those people. Your way of teaching is so clear that even I can understand it most times. I have wanted to enroll in some of your classes but was in fear that I would get lost and become overwhelmed in the class. If you do not offer such a class at this time I would like to encourage you to consider putting one together. I am sure that that are a number of people in you audience who feel the same way that I do. I don’t think that not comprehending the material is all the student’s fault. It can be the way it is presented. Again, I feel that when I am reading your material I am sitting right next to you and you are so passionate about what you are doing that you want to take the time to make sure you are coming across in a way that people can get it. Thank you for taking the time out of your day to care about those of us who are aspiring to become good writers. A thousand thanks to you Henneke! My business blogging course is suitable for both beginning and advanced bloggers. The requirements for joining the course are (a) having a rough idea of what you want to write for whom and (b) have a good command of English. I don’t teach grammar – but I don’t think that’s what you’re looking for?